I read the "into to obx" thread but didnt see much info on lures. Gotcha lure, a bucktail (weight depending on if you are fishing soundside 1/2- 3/4oz or oceanside 2oz), a bottle popper and a pencil popper (2-3oz). Here is my rationale. 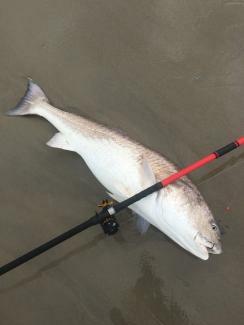 Gotchas are very popular there for spanish and sea mullet; bucktails are very versatile and work well for flounder; and the poppers create enough surface commotion to interest redfish (particularly at predawn). Small bucktails, Stingsilvers, Berkley Gulp on a jighead, and a Spook type topwater will do just about everything for you. Colors vary. Popping corks in front of soft-plastics are effective as well. You could cut from four lures down to two. First and foremost, what is called metal. 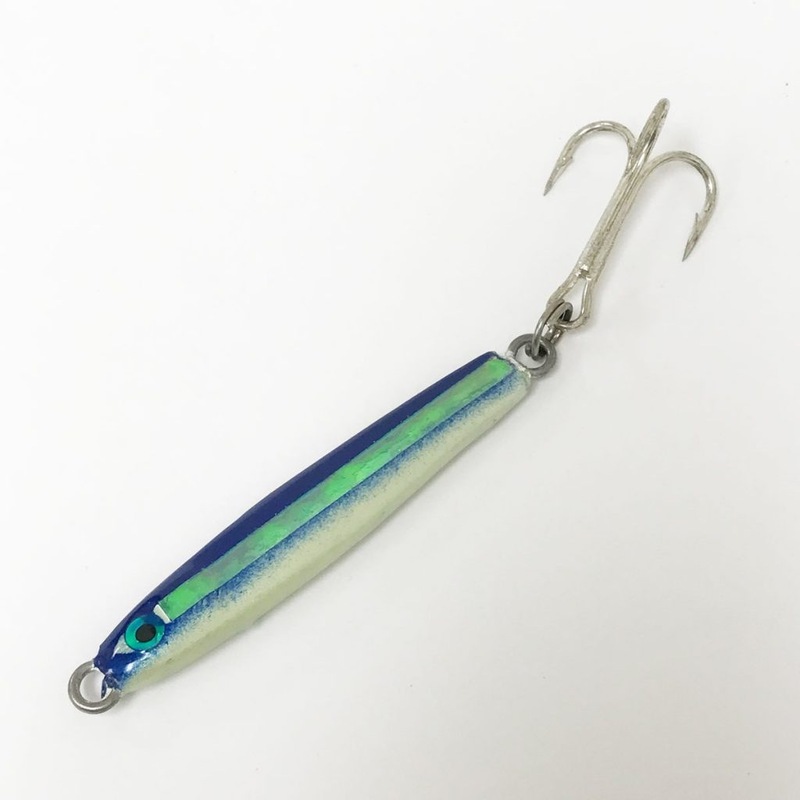 A stingsilver, hopkins, glass minnow type lure in the one to two once range. I have 50 or so with me at any time and 90% are plain silver, some guys swear by certain colors. Used mostly for blues, albies, trout and spanish macs. pic below. 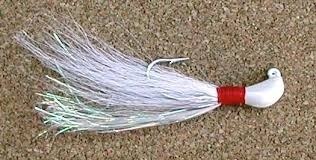 Second lure would be a bucktail jig in the 3/8 to 1 ounce range. Tip it with a gulp swimming minnow, strip of squid, flounder belly, etc. 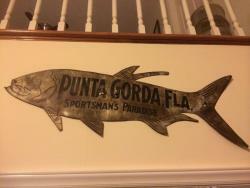 Used mostly for flounder, puppy drum, trout. I have tons of other lures in my truck, but all they really do is take up space. Edit to add that this is for fishing the surf. From a pier, gotchas are must haves and I'm sure many other lures could be added to the list for fishing the sound, which I know very little about. Fishing the beach vs. a pier vs. the Point vs. the sound vs. an inlet are all pretty different. Just as anywhere fishing, seasonal patterns make a difference too. 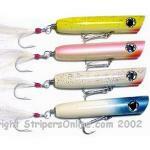 You probably only need 1-2 lures for each of these, some may use the same, but they are all pretty different. If planning to spend time at each, you would likely end up with 10 different lures, different colors for each, and multiples of the ones you have the most confidence in. Could someone post pics of what youre referring to or recommend a a handful to start? Mostly beach, but I will be fishing before dawn and after dark as well, and will likely try a pier. I would hold off on buying anything until you are there. Find out what the weather is going to be. If windy, you may not want to be on a pier... If water is cloudy vs. clear, different things to use and fish to target. The local bait shops are your friend!!! You might spend an extra $5 on a purchase of $30-$40 of stuff, over Walmart or internet tackle shop. But will be the best $5 spent on your vacation. 95% of the bait shop employees are more than willing to talk to you about fishing. About what lures to pick up, how to rig them & action to give them. I was planning that - and a second rod. i wanted to make sure I had something to start with at least. Check this thread for the video a member posted on how to work the Gotcha plugs. One thing to note, keep working them up to the pilings. A good bit of the bites will end up happening up close there. Just be careful not to catch the piling. I have lost a few to them getting stuck there or under the pier decking... I think they talk about rigging on these too. Also, if the water is somewhat clear, you should see your plug the last 20 or so yards. If it is not swinging back and forth, you may need to adjust the eyelet or tie another not. I have had the best luck with a nonslip loop knot. Might go by some other name too. If your plug is dancing they way they want, it seems to catch more than color. Even more so, not catching if not moving the way they want it to. If planning to do this a lot for a week, I'd suggest a mechanic's glove for your rod hand. The inside "webbing" of your thumb to your index finger may get a little raw after 3-4 days of 3-4 hours per day of that motion. Just for fun, next trip I'm using a popping cork with rubber underneath in the surf. It works like a charm sound side...just like the folks in TX and LA and the old timers on the banks used the rig for flounder. Check out Pamlico Tackle website for pics. Simple set up, a popping cork on shock tippet and 3 feet of leader with a sharp hook and garish-colored rubber swim bait. Better have a stiff tipped rod! Mirror lures, shiny metal and soft plastics work for trout and puppy drum, inside or out. Tip the last two with squid, shrimp bits or fish bites. Piers...add gotcha plugs. Geez...first of all, it’s not a fresh bait destination any more than any other place. As a resident of the area, I never fish bait. The answer to to your question relies on the time of year you are there. One or two lures is all you need, but those will change dramatically depending on the time of year. More info needed. Use a pink and white Gotcha diving plug off Avon Pier for Spanish. We were up there checking it out about 10 years ago and this 14-15 year old kid was casting it out and ripping it, reel, rip it hard, reel and hook up. He caught like 10 in 5 minutes. id wait to get down there though, they have special ones that you can’t get up here. Bucktail is exception of course. The lure posted by Byron works. I get them in pink and white, for the trout.